Great Lakes Express Delivery provides delivery service for a single envelope up to 3 full size pallets…and anything in between. Delivery areas in town, in the state of Michigan and throughout the Midwest. We provide professional service, courteous drivers, efficient and economical delivery solutions. Our commitment is to provide efficient delivery solutions for every customer. Our experience and attention to detail will allow us to understand your delivery needs by providing reliable shipping and delivery for your business. Where ever your business goes, Great Lakes Express Delivery can take you there! 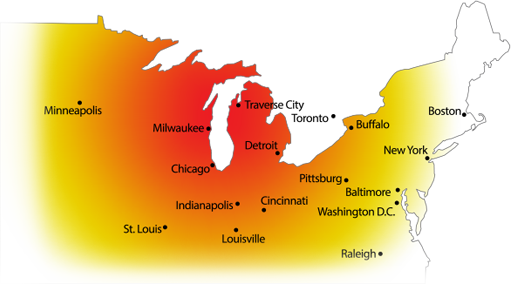 Great Lakes Express Delivery has interstate authority and travels throughout Michigan and the Midwest to serve the needs of our client base. Great Lakes Express Delivery is licensed and insured and has an experienced, screened driver base with over 50 years experience in the logistics industry. Big or small, our extended fleet of vehicles means Great Lakes Express Delivery has the right vehicle for your job. Great Lakes Express Delivery is licensed and insured and has an experienced, screened driver base with over 50 years combined experience in the logistics industry.